There are two ways you can go if you want to escape New York City. The most popular one follows a route east along the coast and ends up in an area general known as the Hamptons. Geographically the Hamptons is a relatively small area and with its popularity ever growing the ratio of visitors per square mile at the busiest time can reach epic proportions. If your reason for removing yourself from the city is peace, quiet and introspection, this might not be the right direction for you. The other option is to head north up the Hudson Valley and then veer left into an area known as the Catskills. If you are inclined more towards mountains, the country and wide open spaces, head north my friend because here you can clear your head, fill your lungs with fresh air and your belly with the fresh picked bounty of some of New York State’s best small farms. 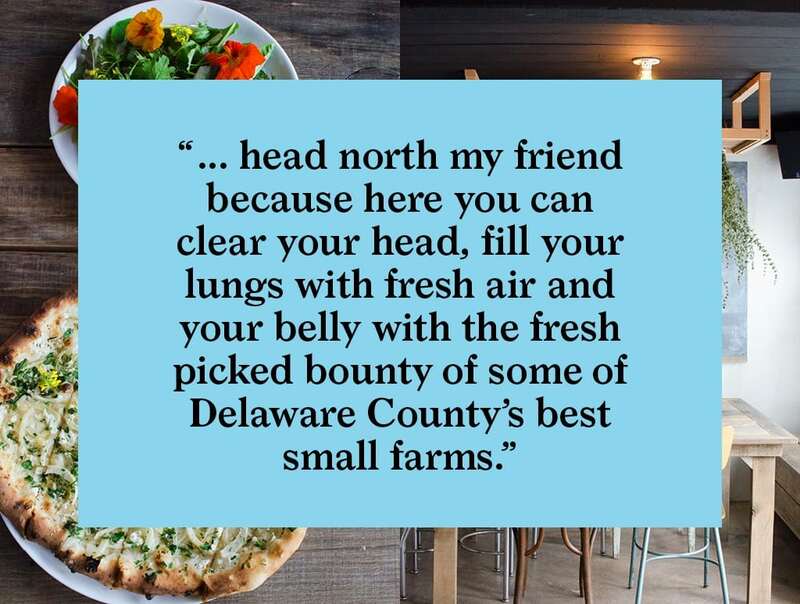 Taking advantage of the rich and ready produce of the area’s local farms and a steady stream of road-tripping New Yorkers, a new generation of chefs and entrepreneurs has taken up residence in the area’s tiny towns. 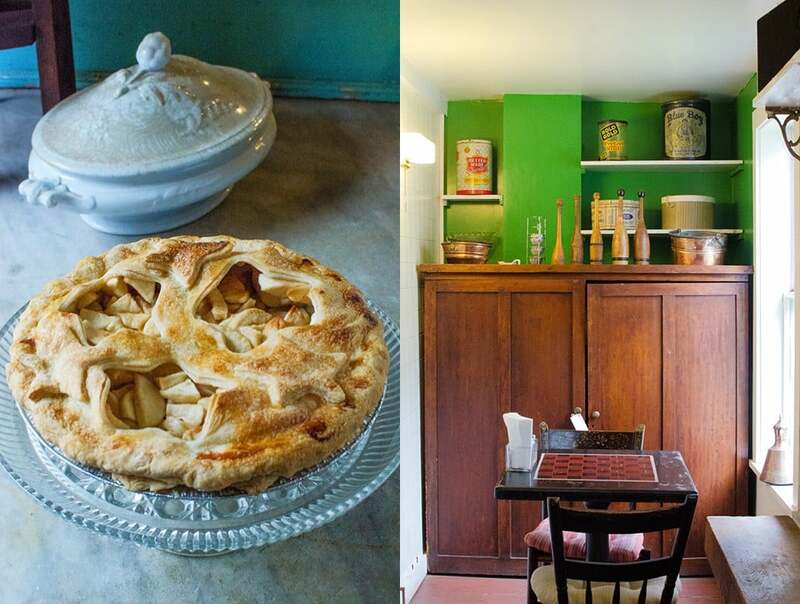 Rumors of happenings in the Catskills were reaching us with such regularity that we could no longer resist the urge to take our own road trip and taste for ourselves. So here we go on our next installment of Eat a City. 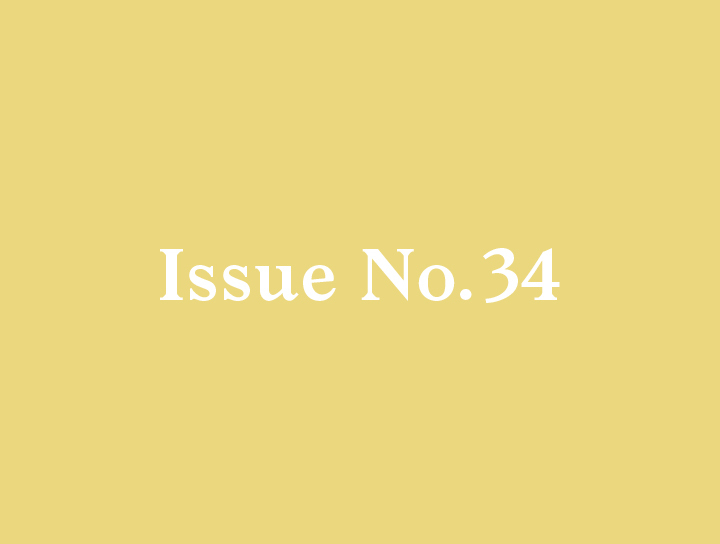 This month—the Catskills. 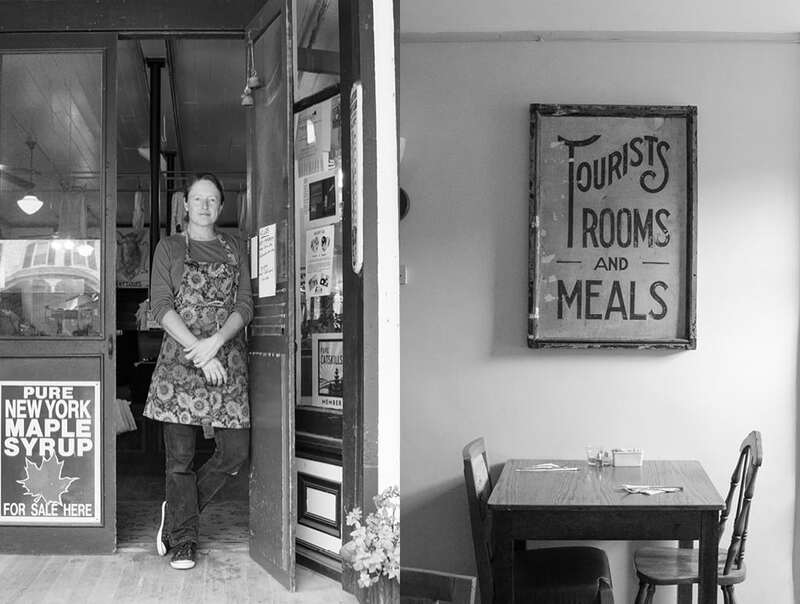 For our first stop we are visiting Table on Ten and its proprietor, chef and innkeeper, Inez Valk. After buying a lot near the small town of Bloomville a few years back and building herself a weekend cabin, Inez was looking for a way to live and work full-time in the Catskills. 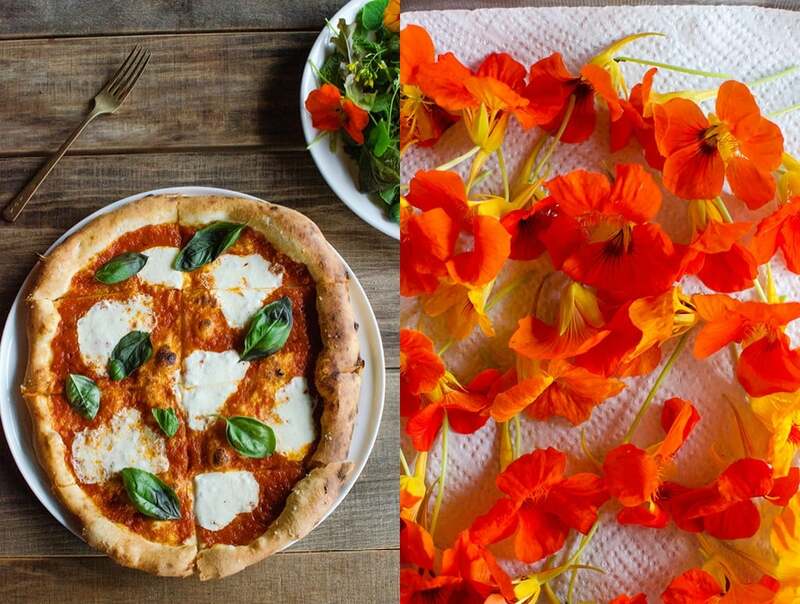 Inez grew up in Holland and upon moving to New York became interested in cooking. 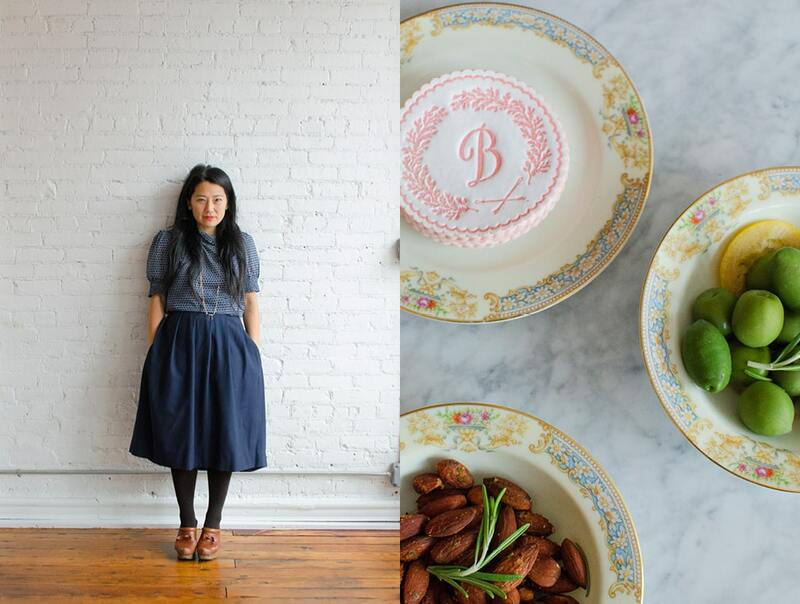 She set about finding a way to build a business around her interests. 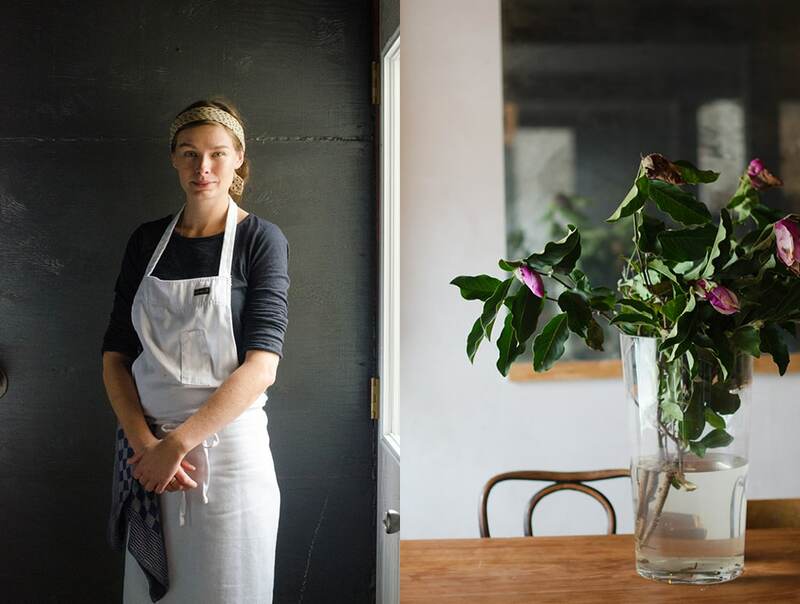 After working for a time with Emily and Melissa Eisen of the famous Brooklyn pie company, Four and Twenty Blackbirds, she was inspired to try her hand at starting her own food and hospitality business. For some time, while coming and going to her cabin near Bloomville she would pass a tired old boarding house where Highway 10 runs through town. It finally occurred to her that this might be a great location for her enterprise, and she investigated further. It was for sale! So Inez snapped it up and Table on Ten was born. It has become a real meeting place for locals and New York transplants spending their weekends away from the city. In the morning, while enjoying our coffee, a procession of local farmers was coming through, dropping off their fresh produce and lingering for a quick coffee and a chat. We were quickly drawn into the conversation, hearing about the season, the weather and what was coming out of the ground this week. 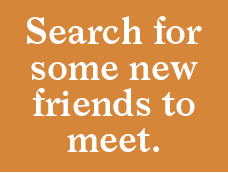 There are not too many places where you can so easily be drawn into local society. 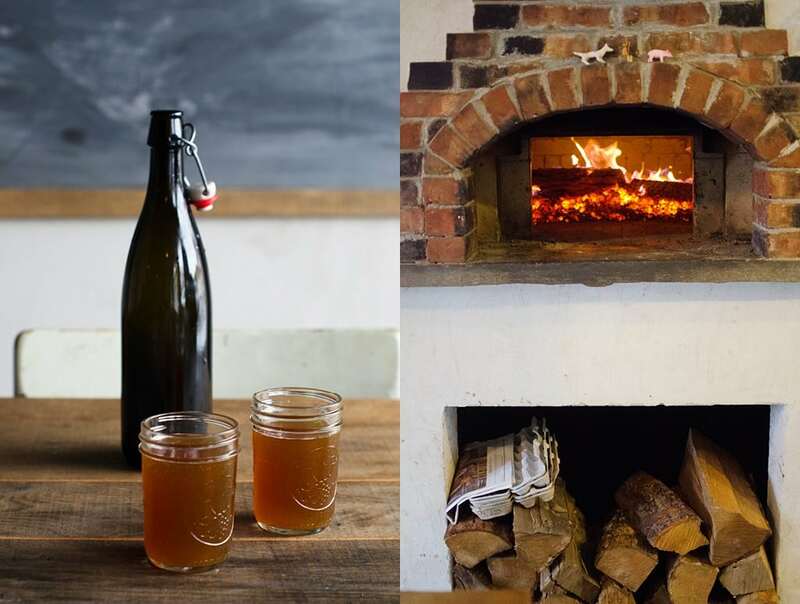 Friday and Saturday nights Inez serves classic brick oven pizza, with her own sourdough base and locally famous four-hour marinara sauce. Luckily we timed our visit on Friday just right. In the afternoon everybody was busily preparing for the night’s meal. It was a hive of activity. The layout of the space is not too far removed from what you might think of as a house so that, combined with Inez’s team’s obvious dedication to getting every detail just right, it has the feel of a family preparing for a party, rather than a restaurant. 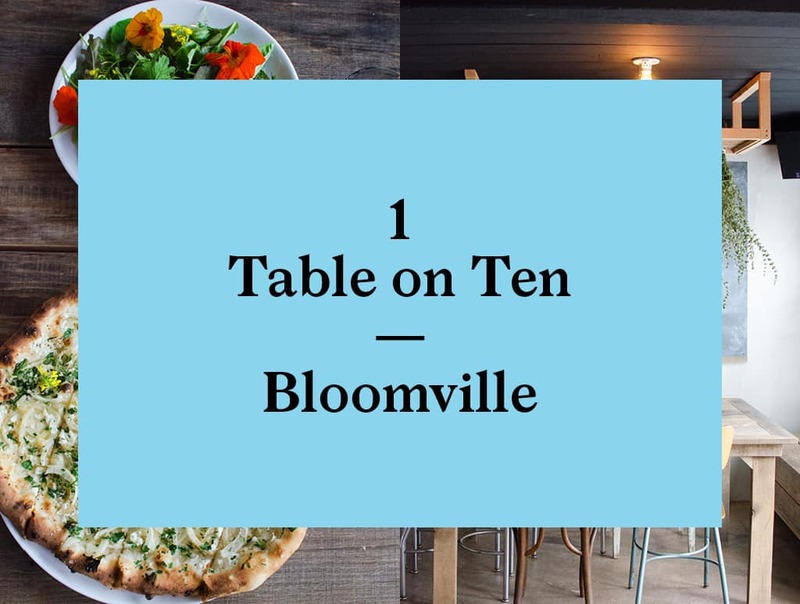 Looking around, Table on Ten is a simple place: a quirky old building brought back to life, made modern where it needs to be, but for the most part left alone. So why does it feel so special? Talking to Inez it all makes sense. 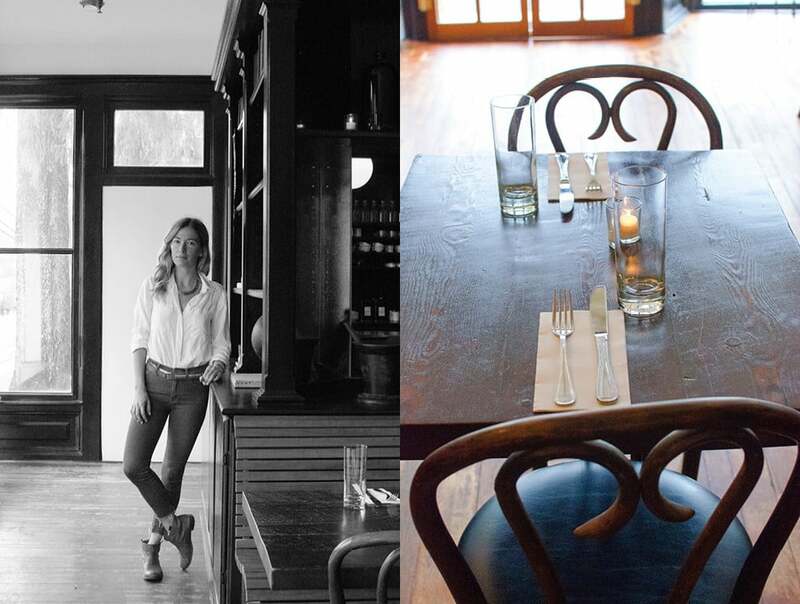 Her warm, calm, confident temperament steers Table on Ten like a ship and everybody, from staff to out-of-town visitors to locals, wants to get on board. 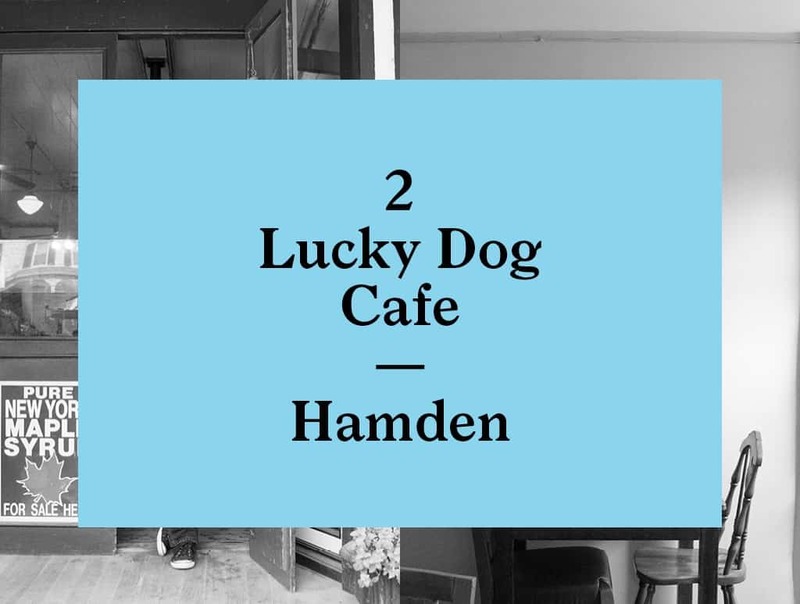 A bit north of Bloomville is the town of Hamden, where we are going next to check local eatery and general store, Lucky Dog Cafe. Holley Giles and her husband Richard purchased a 160 acre farm and moved to Hamden in 2000. 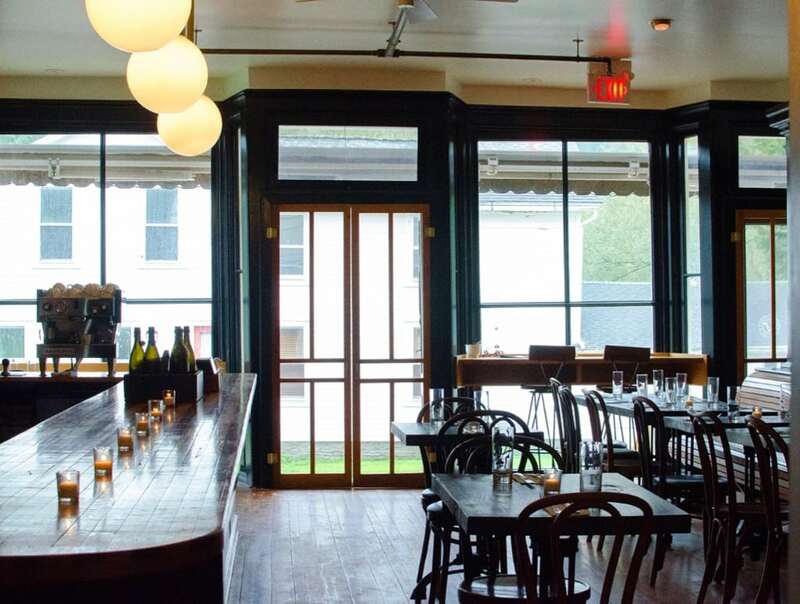 While Richard has his hands full with the farm, Holley runs the cafe, store and the nearby Hamden Inn where legend holds that Teddy Roosevelt once stayed. She also has a hand in the production of several local cheeses. I guess the real question is what does Holley NOT do? 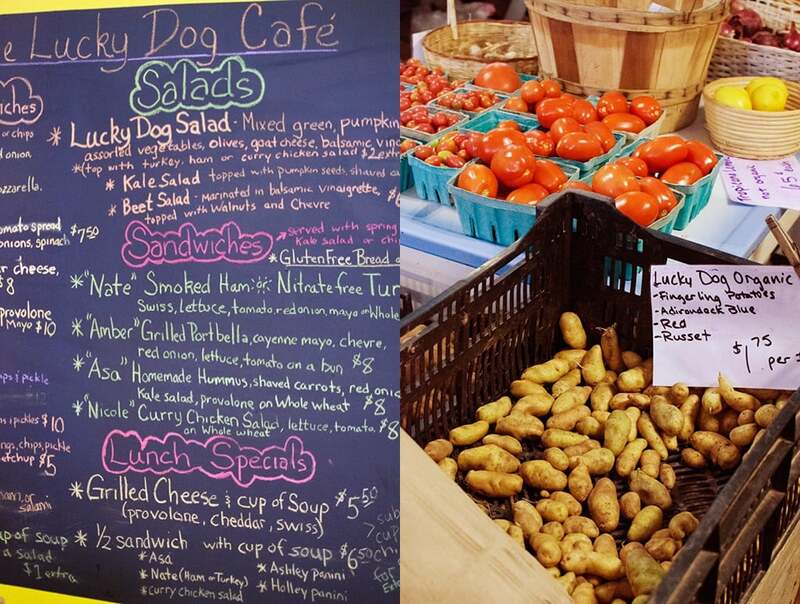 Lucky Dog Cafe serves Holley’s homemade pies, fresh sandwiches and salads. 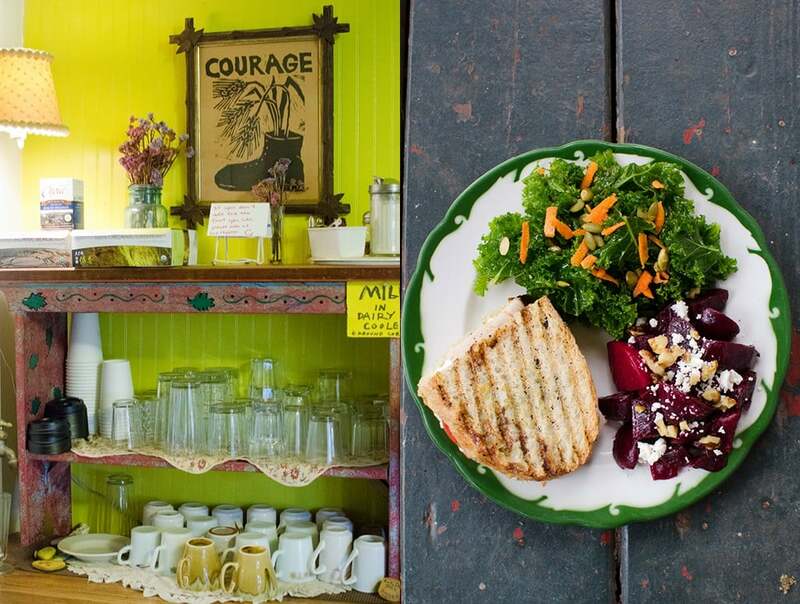 In the front of the cafe is an authentic circa 1800 general store, stocked with vintage dish towels, candies and fresh produce from the Giles’ farm and other food producers in the area. After lunch at the Lucky Dog, visit the cheese counter and pick up some of the local Ouleout cheese from Vulto Creamery. It’s an upstate New York version of Tallegio. Very good. 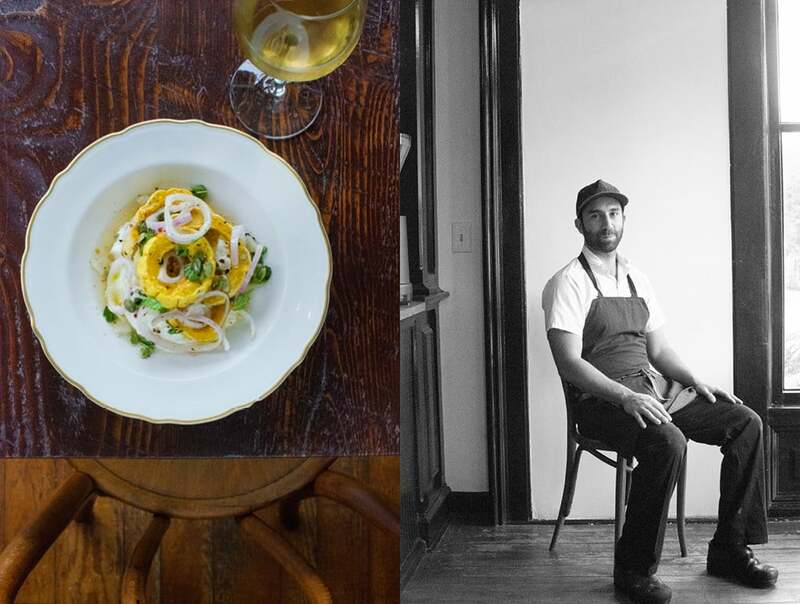 A short drive south over rolling hills and farm land and we arrive in Bovina to visit with Chef Sohail Zandi and Sara Elbert of Brushland Eating house. After toiling in the high stakes New York food scene for many years Sohail and Sara were ready for a big change. “Big” meaning goodbye Big Apple. 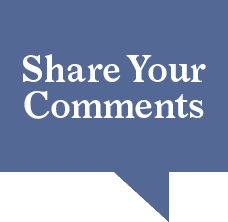 Says Sara, “Our friends were all shaking their heads, they thought we were both nuts”. Undeterred by their friends’ short-sighted derision, they pulled up stakes and moved to the picturesque farm town of Bovina. A nice two-story building on Bovina’s only thoroughfare was available. And conveniently, the previous tenant also served food, so at least they did not have to start their renovation from scratch. 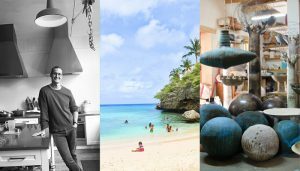 With Sara’s impeccable eye for interiors, Brushland’s unique character started to take shape. The floor-to-ceiling cabinets are painted glossy black and populated with an eclectic mix of local, vintage objects. A long, shared banquet table runs the length of the room and the use of old Thonet style chairs gives the room a real 1920 Eating House feel. The creaking screen door really adds to its authenticity. 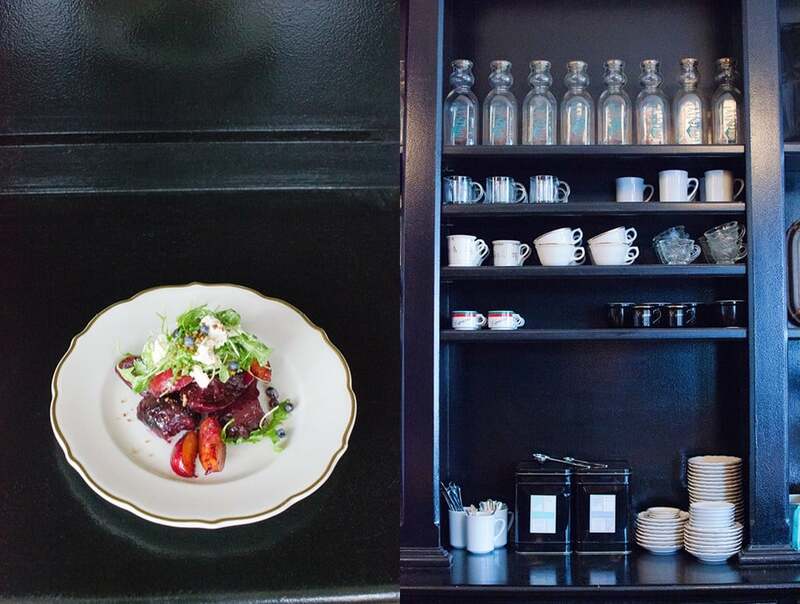 Brushland is old and new, comforting and challenging, the perfect setting for Sohail’s new take on local cuisine. The night’s menu, handwritten on a chalkboard, is simple and direct – the kind of dishes I look for in New York but rarely find. Great ingredients, no fuss, and each dish with an interesting flavor twist. Selfishly I wish Sohail and Sara had not left the city so I could experience Sohail’s exceptional talent for food more often. 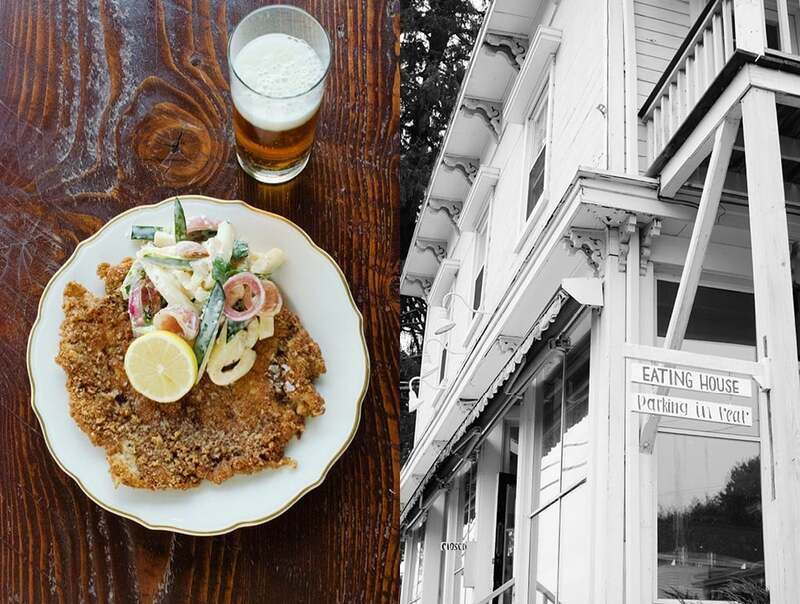 His pork schnitzel, paying homage to the area’s German heritage, with homemade breadcrumbs, was delish. A salad with fresh zucchini and radishes in a yoghurt sauce was a perfect accompaniment. The wine list is compact with a great selection from France and Italy, all at a reasonable price. 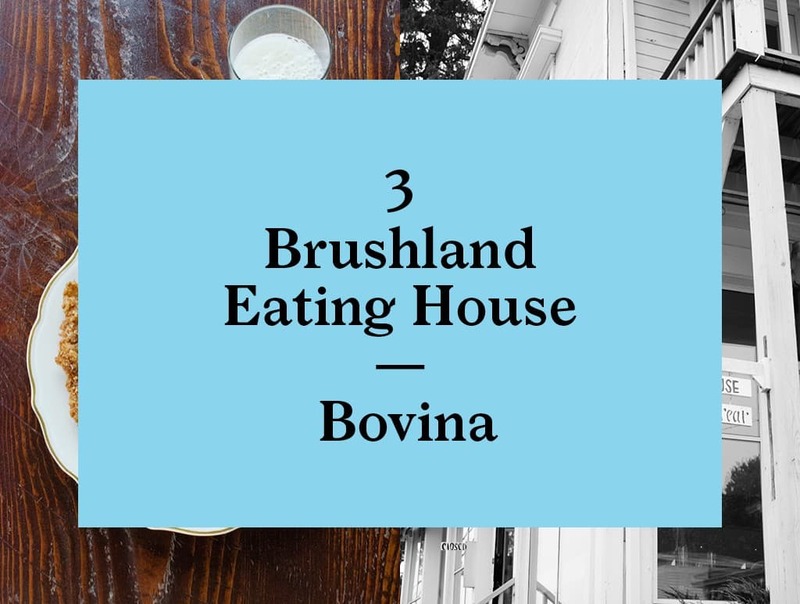 On a funny note, Bovina is a dry town so Brushland is only able to serve wine by virtue of its three rental rooms upstairs. So drink up! If you get into trouble you can spend the night. Fortunately we have a designated driver in our party so although we would have liked to stay longer, there is more Catskills to eat and we have to move on. Next stop, Phoenicia. Making our way from the farmlands of Delaware County we now follow New York Route 28 back into the forests of the Catskills. 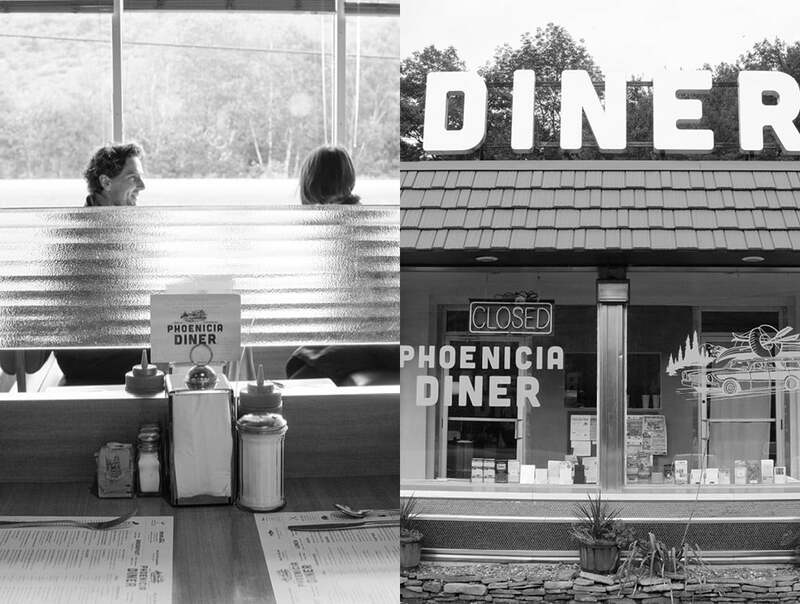 The Phoenicia Diner has been a fixture on Route 28 for ages although for most of that time it has not been known for its excellent food. 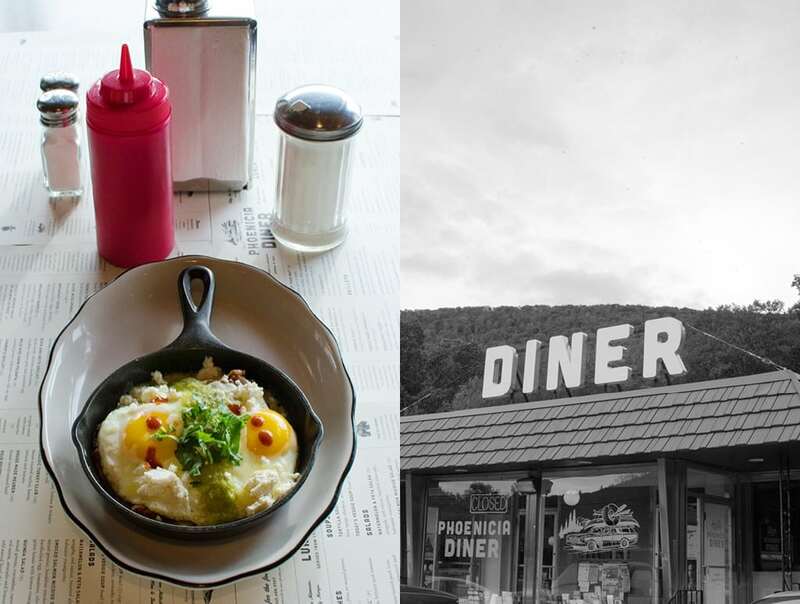 That was until in 2012, when longtime Catskills visitor Mike Cioffi purchased the Diner and breathed new life into the place. Fortunately he kept the “bones” of the place intact and focused all attention on the food. 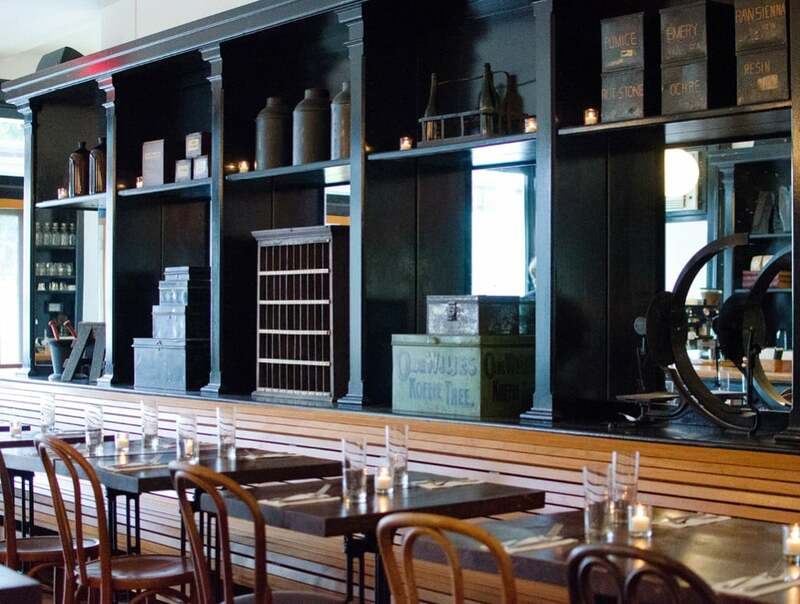 Gone is the tired old greasy menu, and in its place they now serve traditional diner favorites with the best locally sourced ingredients available. They even make their own Corned Beef! 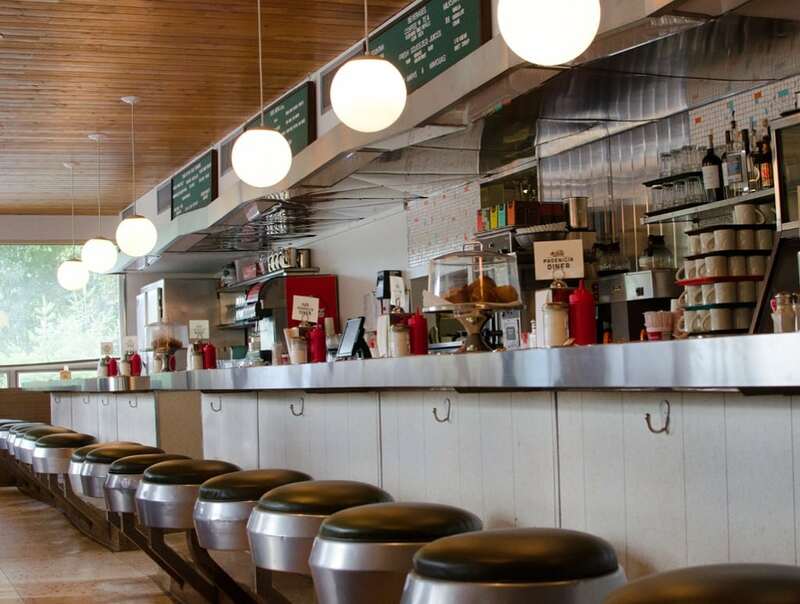 That’s a real throwback to when diners made real home-cooked food: way before my time. 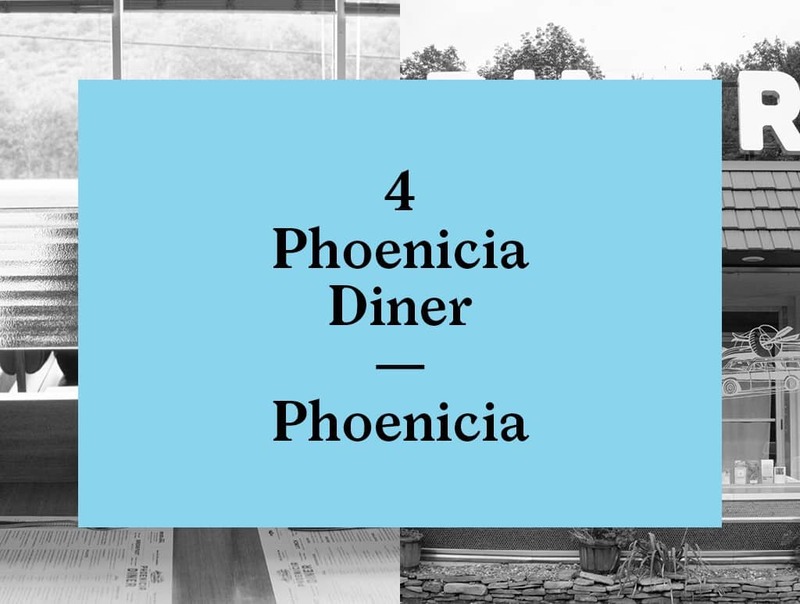 The Phoenicia Diner is super popular with locals and travelers alike. I have driven by at all hours day and night and there is always a full parking lot. We visited mid-week just as the summer season was waning and the place was still buzzing. I asked the waitress for a recommendation and she suggested that the Skillets were a particular favorite. I can see why. The placemats are conveniently printed with all the local highlights so you can plan what to do next as you enjoy your meal gazing across Route 28 at the majestic Mount Temper. 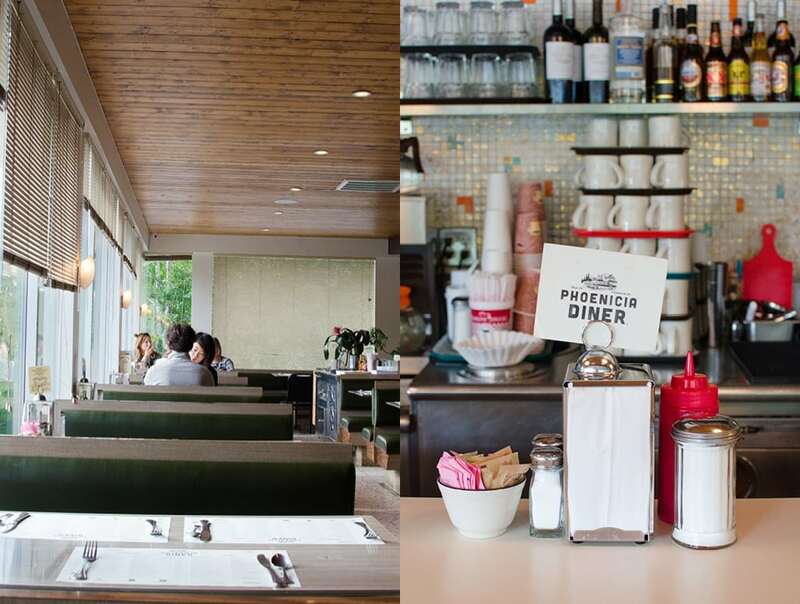 Arriving or leaving the Catskills, the Phoenicia Diner is the place to stop for some great grub. Our final stop is well on the way back to the city. We have driven as far east as we can, all the way to the banks of the Hudson River. 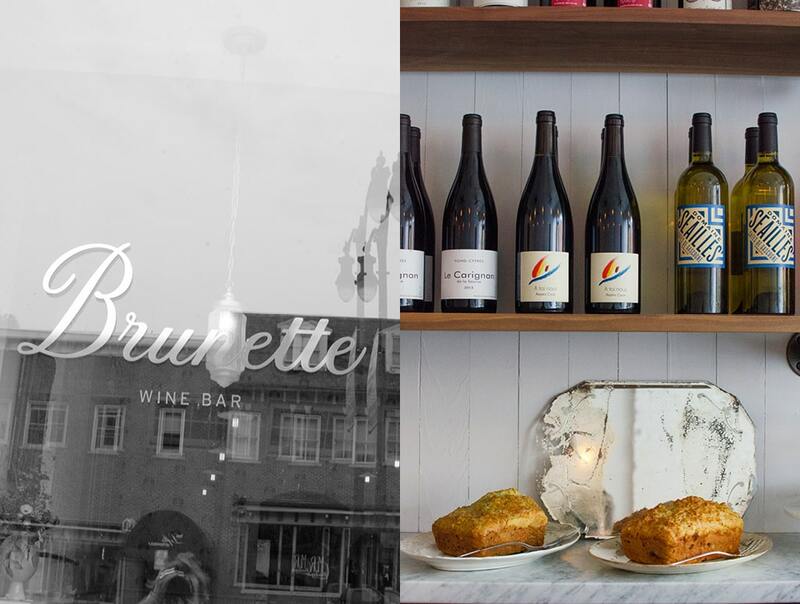 Here we meet Tracy and Jamie Kennard in their recently opened wine bar, Brunette. 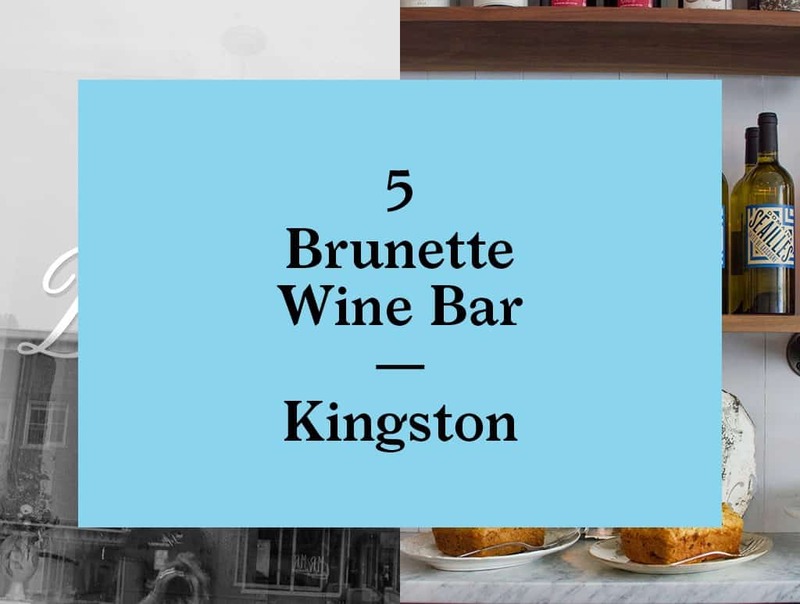 Working in graphic design and the fashion industry in Manhattan for many years, Tracy and Jamie picked Kingston as a good place to get away from the city. 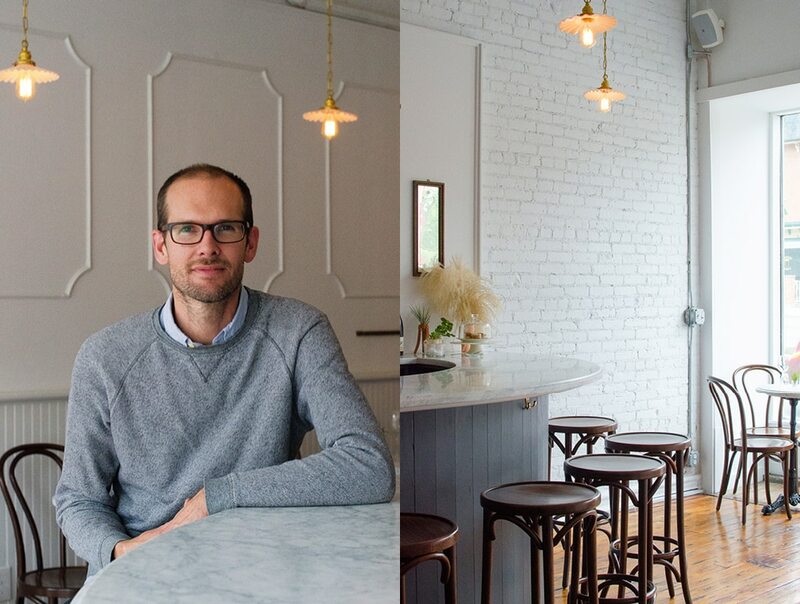 Now, looking for a new challenge, they have taken over a former barbershop in the gradually gentrifying Rondout district in Kingston and remade it as the neighborhood’s only wine bar. 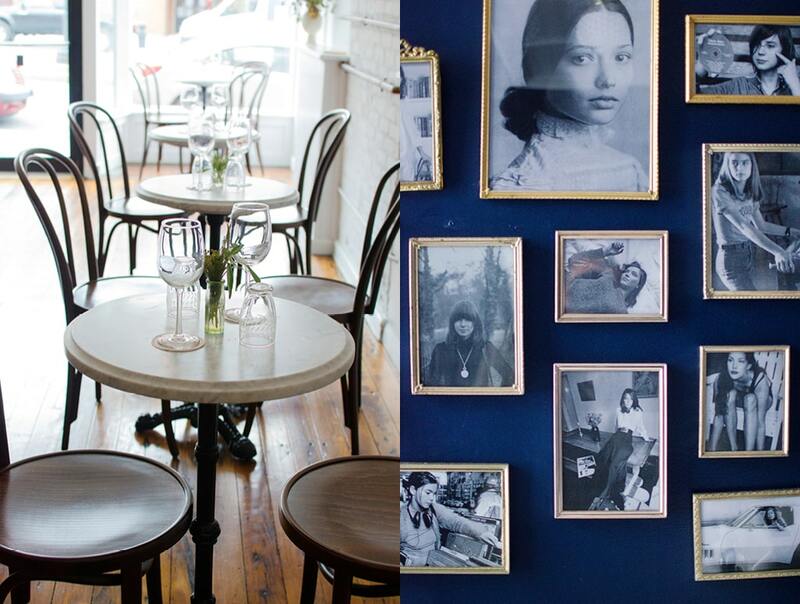 The remade space is all Parisian bistro—if that bistro was in New York. Vintage lamps, pastel wallpaper and white marble surfaces give the space a feminine air, offset by the rough plumbing-derived shelving system that grounds the space firmly in this traditionally gritty Kingston neighborhood. There’s a nice touch in the bathroom: an eclectic collection of photographs of cool Brunettes. Tracy and Jamie have a great eye for detail. Brunette’s wine selection is unique. Many of their offerings are unavailable anywhere else in the area, so you can be sure of some tasty surprises to challenge the palette. 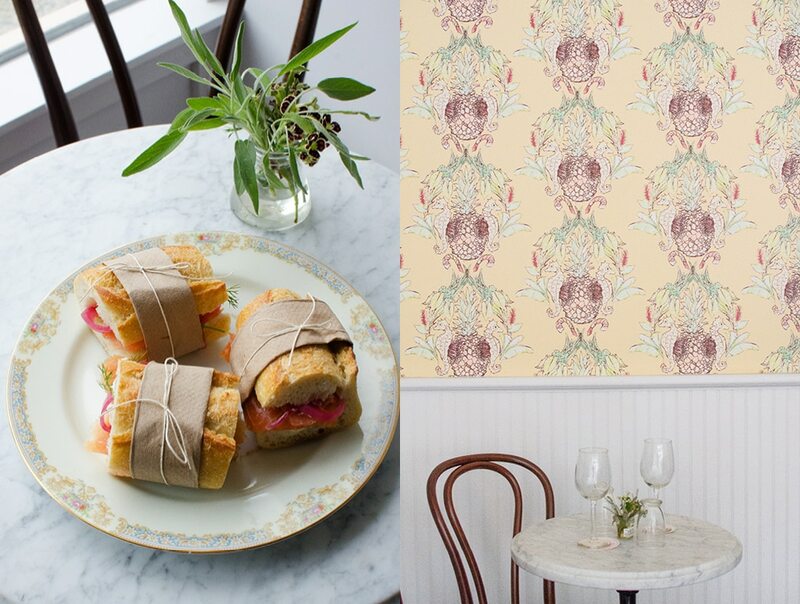 Tracy’s homemade cakes and delightful savory sandwiches are a perfect companion to Brunette’s wine list. 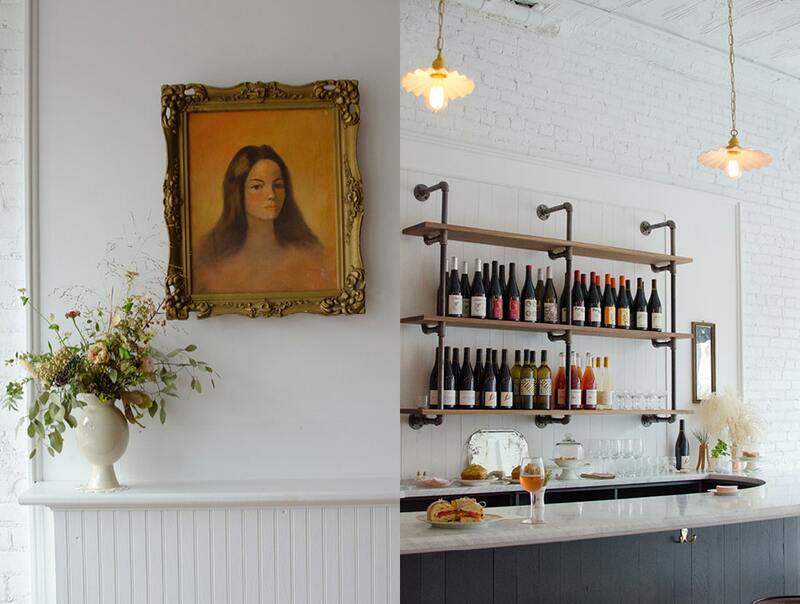 Going to or coming home from the Catskills, Brunette is a great stop along the way. 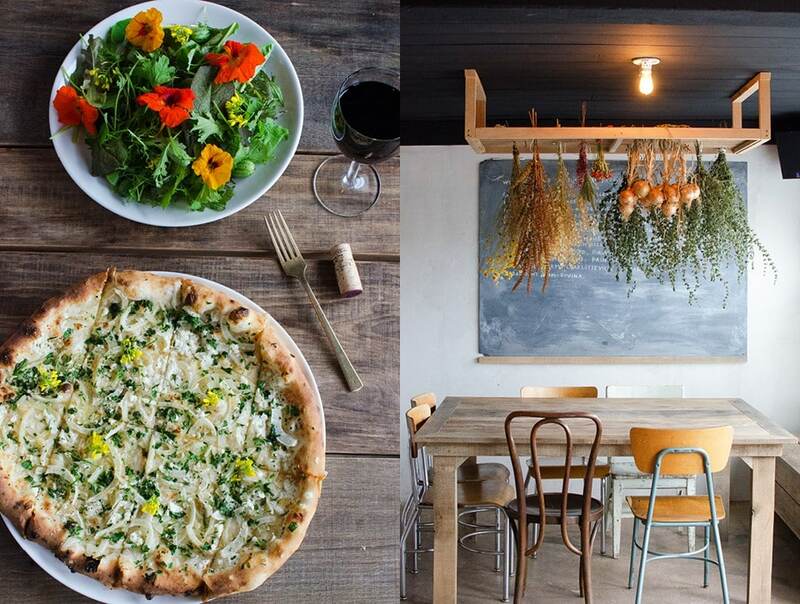 Planning a trip to the Catskills? Here is the current weather and what to expect for the next few days.